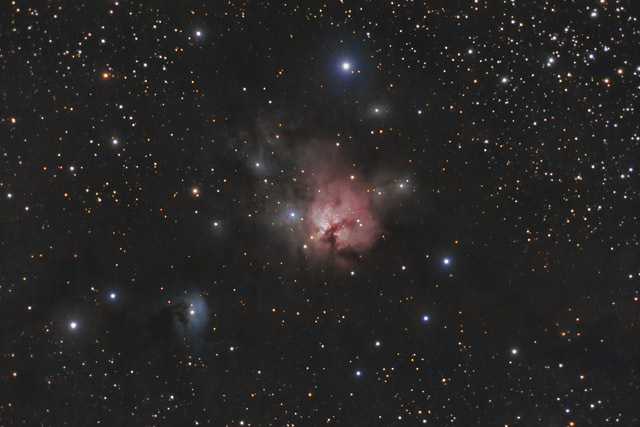 NGC 1579 is an emission and reflection nebula that bears some resemblance to M20, the Trifid Nebula. This earns it the nickname of the "Trifid of the North". The nebula is about 12' in apparent diameter, making it a little less than 1/2 the apparent diameter of M20. The nebula's reddish/pink color comes from ionized hydrogen gas, while the blue regions illuminate by reflecting the light from the hot blue stars within the nebula. NGC 1579 is also known as Sh2-222. The blue reflection nebula in the lower left is IC 2067. The dark nebula surrounding both objects is LDN 1482. In this image, North is to the left. This image is cropped to 76% of the original full frame. Software Used Images Plus 5.0 for camera control, calibration, stacking, digital development, Lucy-Richardson deconvolution, multiresolution sharpening, star shrinking, smoothing and noise reduction. Photoshop CS5 used for levels and curves, selective color, high pass filter, star shrinking, lab color, saturation adjustments, vibrance, screen mask invert, lens correction, and unsharp mask. Gradient Xterminator for gradient removal. Carboni Tools for additional saturation adjustments, noise reduction, and smoothing. HLVG for additional color correction. Registar 1.0 for stack alignment. Focus Magic for focus restoration. Notes I enjoyed imaging this object, as it is one of those targets that is commonly overlooked. While its not as impressive as its namesake, M20, the nebula is very beautiful in its own right. The extended dark nebula running through the image also adds an element of beauty to the image. Astronomy Magazine selected this image as their Astronomy Picture of the Day for May 21, 2013 - number 9 for me!